As I said when I introduced myself, thank you all for making everyone welcome; it’s increasingly rare for an online forum! Picked it up yesterday and had a wonderful play today, oil warm, half throttle, up to 3500 - the noise, the sensation, just wow. Cannot wait for the brakes to bed in a little more, but getting there. They said in 1997 if John Major had met everyone personally, he would have won the election, I’m not sure of that, but if everyone who wanted to buy a sports car to drive and not pose, then all Lotus have to do is get them in one for 45 minutes - job done. - Does anyone have all season/winter tyres on the OEM rims? If so, what brand and tyre - struggling to find some at the moment? - it seems like the rubber strip under the front splitter is no longer supplied, is this right, or should I mention it at it’s run in service? - is the supplied radio the most complex bit of IT in the world, or am I getting old? Very nice...I do like the blacked out look..what model is that? Black rubber strip was only on the cars with the older style front clam. The car looks amazing, carry on enjoying! In regards to the rubber under the front lip, i have it on my 430 cup. I noticed it's not there on the 410 for some reason (at least on the press photos they did) - not sure why. It is quite lower than that of the 380 cup though, it scrapes everywhere. Very nice, although I guess I’m biased with the colour choice! Rubber, I’ve not fitted to s3 wheels for winter and probably won’t. If it’s your daily they are great, I had winter rubber on my previous s2 S and would happily carry on going past all the 4wd cars in the snow. Rubber Lip: not fitted to 410 as you have a grp splitter I believe. 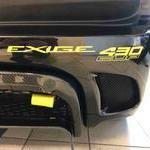 The 430 has a carbon splitter around 10mm thick, this allows the rubber lip to be fitted by screwing in. The grp on the 410/350 is about 2mm thick with curved edge so there is not enough to screw into. That was the case with the 410s if seen so far, so would need a bracing plate or move to carbon. Head Unit: One of the worst cases of user design I’ve seen for years. It lasted a few hours in mine before being binned. Can you recall what the tyres were? If it is CF, then you need part number A138U0246K plus skrivets and tape. Have a look here. For some reason only seems standard on 430. Enjoy.... and who needs a radio anyway! Thanks Pete. I had the 410 stickers removed too! I do you know when the oil is warm? I have done some number crunching (based on specific heat capacity and straight lines of heat output from the engine) and I get to 10minutes over the water teamp being at 85degrees - does that resonate with most people. It sounds about right, but it’s a guess as there is no oil temp measured frustratingly. It’s a winter project for me to fit back in, need to find a tap point or might change to a baffled sump. Tyre chains RUD-matic Classic R48493 snow chains, fitted only on the rear, and only on the approved winter tyres. It says cast wheels, I'm sure there is no reason the forged wheels can't be used with winter tyres? I have mounted my winter tyres to the cast wheels as I wanted my forged wheels to be kept pristine though. It says cast wheels, I'm sure there is no reason the forged wheels can't be used with winter tyres? It's an OEM fitment, I guess they just keep it less expensive. I can't see any reason why would it be not ok to use forged wheels in the winter, other than keeping them undamaged. OEM fitment is also less wide tyres and wheels in the rear, which makes a lot of sense in the winter time. @Stewie177 I have a spare rubber lip from my 430 if you're interested? Thanks Alex. I did my first speed bump (the one with the lump in the middle) and all was good.